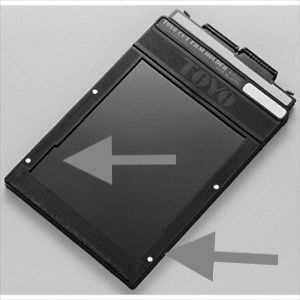 Which 645 film-camera produces distinctive rectangular-shaped notches in the negative margins? The UK's Guardian newspaper published a photograph of the late minimalist-artist Robert Morris by Grant Delin. The portrait-orientated photograph shows distinctive rectangular-shaped notches at the "top" of each edge of the negative's "vertical" boarders. Can anyone say which camera made this image? All I can discern is that the format is 645. I don't think you can determine what specific camera left the observed notches, because it's not a feature or property of the camera's construction. Rather, it's a part of the construction of the film holder. The image you link to is a print of an uncut negative. 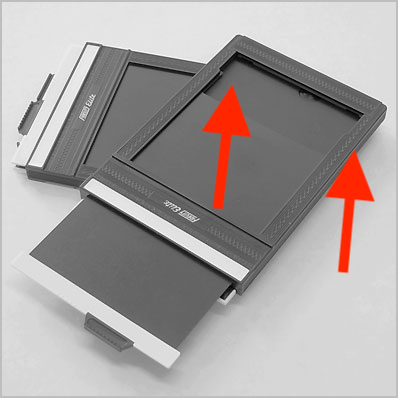 The notches are simply the part of the film that is left visible by the rails of the film holder. Not the answer you're looking for? Browse other questions tagged film body medium-format camera or ask your own question. What are the advantages and disadvantages of negative film versus reversal film? What are the differences between 120 film and 220 film? How do I develop color negative (C41) film at home? How to clean 35mm negative film? How do you remove a film back from a Mamiya 645 Super with no darkslide? How do I use new Lomography 120 Film in a vintage Diana F Flash Camera? What to consider for a second film camera?